Hell on earth. 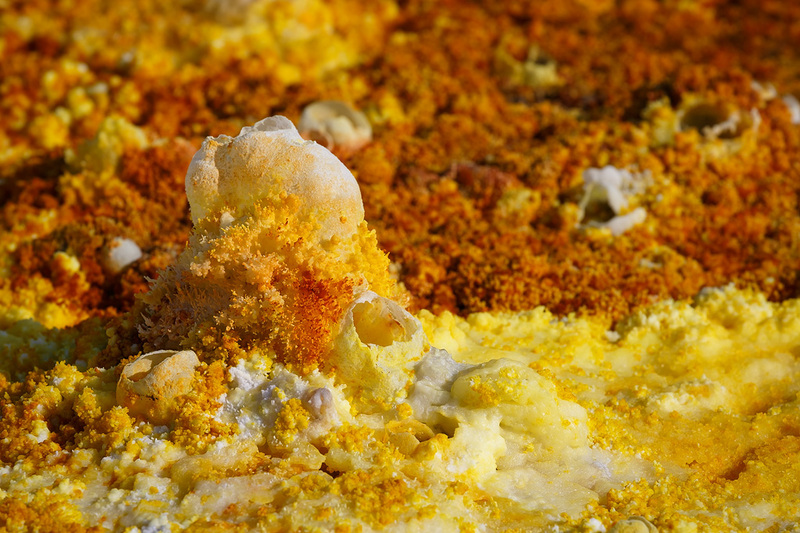 It sounds like hyperbole, but the Danakil Depression is exactly that. In late 2013 I spent 1.5 months traveling extensively in Ethiopia, and I visited the Danakil to scout locations for my 'Earth, Wind and Fire' workshop. 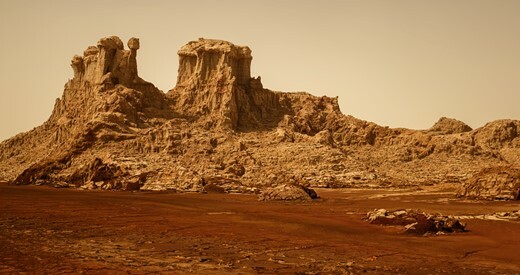 It is, by my own experience, one of the most inhospitable environments you can actually visit. Scorching heat, no roads, no running water, not to mention hotels or any other modern convenience. 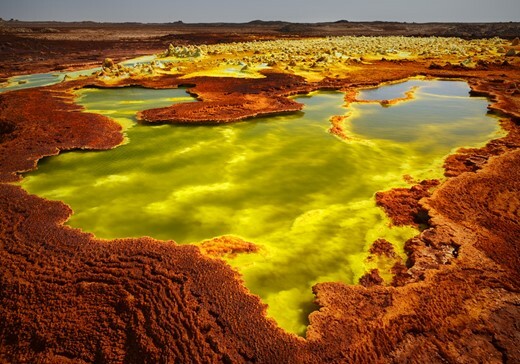 But it is exactly these qualities which make the Danakil Depression one of the most fascinating places to visit on the planet. 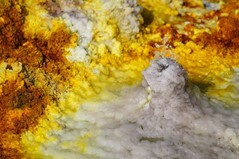 Located in the north of the Afar Triangle, a geological depression formed by tectonic plates that are slowly ripping the earth apart, the Danakil Depression is very low in altitude (about 100 meters below sea level), dry (rain is extremely rare) and hot - so hot that it's famous for being the hottest place on earth in terms of year round average temperatures. Moreover, reaching it requires a day long drive through the desert, which is both expensive and exhaustingly uncomfortable. But it's worth the effort, because this area holds invaluable treasures for the avid photographer. 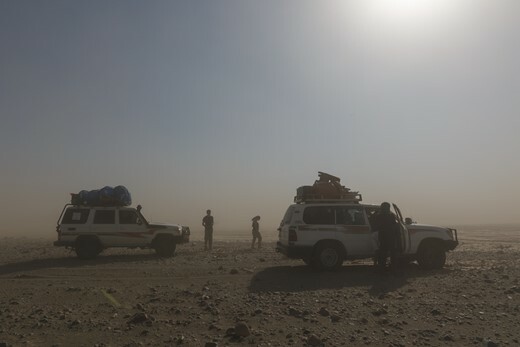 Our journey to the Danakil. Temperatures soared up to 48 degrees Centigrade, and the dust made it quite hard to shoot. 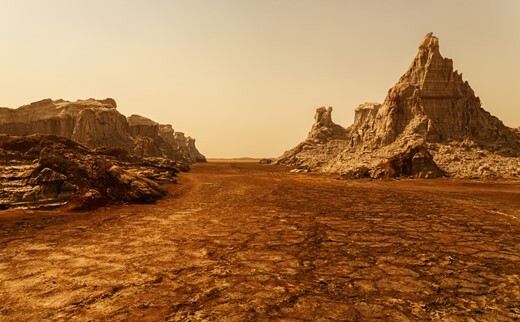 Upon reaching the Danakil after a long drive, one is immediately struck by the vastness of this wasteland. apart of the odd tree and tribal village, there isn't much else around. This makes sense, since little could survive here, but the few humans that do are quite special. Arid, seemingly Martian red hills, dry, cracked rock formations, wide salt lakes, fluorescent green pools of sulfuric acid, and of course, the mighty Erta Ale volcano are the main photographic attractions in the Danakil Depression. In this article, I will try to survey them from a photographic point of view, and perhaps make you think differently about Ethiopia and its natural treasures. A young Afar tribesman. Life is incredibly hard in the Danakil Depression, and the Afar are a hardy folk, farming, mining salt and herding goats for a living. Their appealing appearance and feisty temper, together with the environment they live in, make them unique photographic subjects. The primary means of interaction between the Afar region and the rest of Ethiopia (and the world) is the endless salt caravans, consisting mainly of camels and donkeys, loaded with heavy bricks of salt - the main natural resource in this area. The caravans are very photogenic, both for their sheer size (the most common response I get to my shots is "surely you've duplicated the camels in Photoshop!") and the landscape they march across. This was just a part of a longer salt caravan on its way back to the Afar region. After a night's sleep under the stars, we started the journey to Erta Ale volcano. I was extremely excited to visit Erta Ale after seeing a few shots from there. The 3-hour hike up the volcano was a bit strenuous, but since it was done at night, it wasn't too demanding for any of the hikers. Nearing the top, I started sensing faint odors and noises. When I reached the campsite, the bright smoke was clearly visible. I couldn't resist taking an image of the distant smoking pit and the clear, starry sky. Erta Ale volcano crater as seen from the campsite. 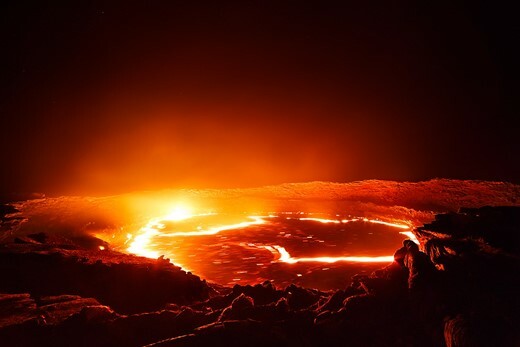 Rising 613 meters, Erta Ale hosts one of only a handful of permanent lava lakes in the world. 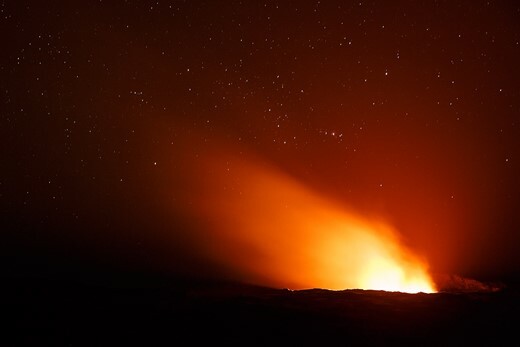 The name "Erta Ale" means "smoking mountain" in the local Afar language, and it fits this name quite well. 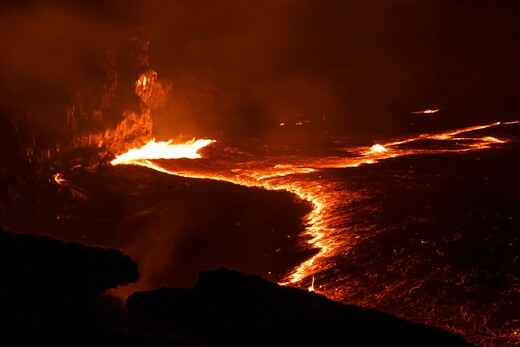 It is also notable for being the longest-existing lava lake, present since the early years of the twentieth century. I knew visiting and shooting this unique place would be very special, but I couldn't quite foresee the level of excitement I would reach upon getting close to it. In my travels I've seen some wonderful natural wonders, but seeing a huge crater, full of red hot, bubbling, exploding lava was one of the most powerful experiences I've had so far. It wasn't easy shooting the pit itself. 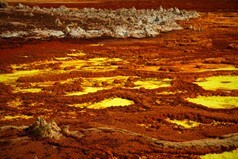 The lava is searingly hot and its brightness changes constantly, and the foreground is much darker, requiring HDR technique to reveal its details. Moreover, the pit is very large, and even with a 14mm lens I found it hard to include all of it. If I had tried to step back a bit, I'd have to lose detail in the lava area, since I'd be looking at it from further away. After several trials, I reached a position I was comfortable with, and shot the lava pool together with the serrated volcanic rock surrounding it. The red glow defined the contour of the pit's edges, contributing even further to the hellish look. It can't be conveyed here, but believe me - the smell matched the appearance of the pit perfectly. After spending the night in the campsite near the volcano, we began our descent to the jeeps. Within an hour's drive, we reached another spectacular location: the sulfur lake. 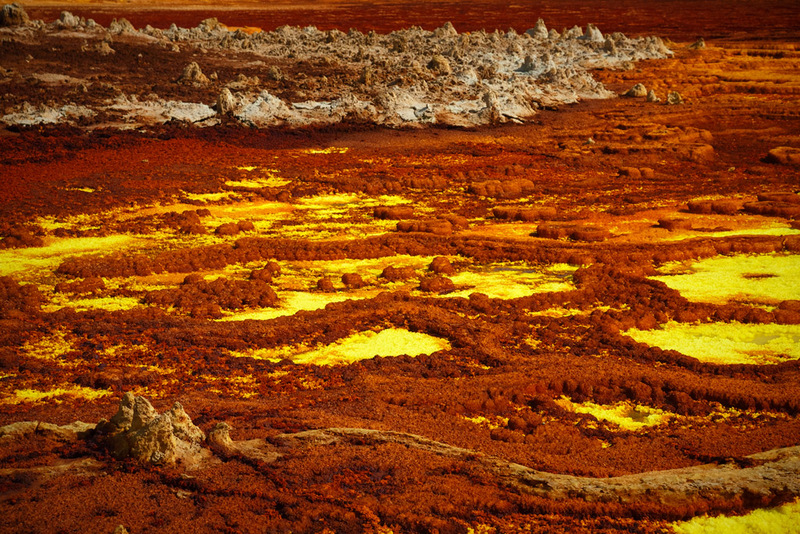 Colors unlike I'd ever seen before, mineral nozzles spewing hot water, crisp red earth and a feeling of another planet are all offered by the second of the two top locations in the Danakil Depression. What's left to do is put on a polarizing filter and, well, start the photo-party. The formations and colors are endless. I especially enjoyed shooting the pools of sulfuric acid, with their surreal bright green color against the red earth. 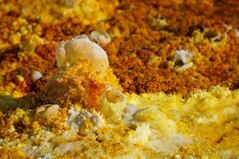 There is much more to see in the Danakil Depression. From tranquil, shallow salt lakes to red, Martian-like hills and rock fields, this region is home to some of the most unique topography on our planet. Hard to reach and inhospitable as it is, I wouldn't visit Ethiopia without stopping there to appreciate and photograph a true hell on earth, but a most beautiful and majestic one. Not too sure I'd make the trip BUT loved the photographs and commentary! Erez; you've just added yet another place to my "to do" list. Not sure whether I should thank you for that ;) Great shots though! I favour my volcano shots, so I'd probably have gone with those; as they're something that relatively few photographers have in their image stockpile. Yep, the sedimentology group of our institute will back there again soon. I really would like to join them once. Last time even the Erta Aale got sampled. Beautiful and stunning. Thank you for sharing. Hell on earth but heaven for photography... Great work! How expensive are these exotic photo workshops? I remember antartic photo tour cost something like $12K. Oh and one would need at least $10K worth of gear at least. And there are already very similar photographs all around the internet. Some photographers can afford to go on those trips and get a lot out of them. Its not me either but nerd2 you only comment negatively, you should try actually saying something positive for a change. This is what I call "work". An interesting article thanks for posting. While age and physical condition will preclude me from ever visiting the depression, Erez's photos of the places he visited are fantastic. There are a lot featured photographers here that have ONE thing in common. Could you guess what it is ? A tip, it's got NOTHING to do with photography at all. DPR has changed. A lot. To the worse. ??? This is incredible work. How is this not photography? Der Steppenwolf: perhaps you can explain yourself, what is photography according to you? ~Thematic & Vermeero: Steppenwolf didn't say this wasn't photography, he said that a lot of photographers here have one thing in common which has nothing to do with photography. You don't see the difference? Maybe that's a clue. He said "featured" photographers... Not people posting. So his post is completely off base. Articles like this one d preview is sharing are exceptional. "There are a lot featured photographers here that have ONE thing in common." Even so, I think the photos are really cool. Just like I said, there is one thing in common for 95% of all featured photographers on these articles on DPR. I DID NOT write that this is "not photography" or any such nonsence. Some of you may need to learn to read once again. Thing I am referring to has nothing to do with photography but WHO they are. There is the clue, rest you have to figure out for yourself. Don't consider yourself a philosopher and just utter a few vague words expecting then everybody as wise as you to understand them at first glance. Perhaps they just don't talk in riddles. Get a life. Sheesh. What a bunch of sensitive souls. It's only photography, not religion (though you never know on this site). Oh, a riddle to guess... They all wear shoes most of the time but don't take photos of them? We know the opinion will stay hidden because it's irrelevant and apparently negative. I enjoy the photog articles from dpr for the photography, especially if it's from someplace I won't likely visit. But I'm not so sure if one of them was a guy picking up a quarter. I can highly recommend Wilfred Thesigers 'The Danakil Diary', an account of his explorations of Abyssinia just after the coronation of Haille Selassie. He was one of the last great explorers and Arabists, and took some beautiful photographs with an early Leica. Interesting place indeed. 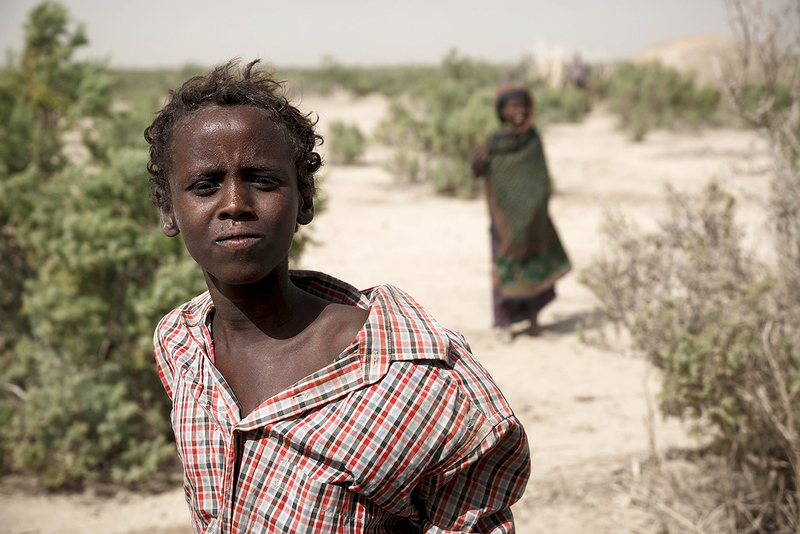 The local Afar people (who used to be known as the Danakil) have a well-deserved, notably fierce, reputation. One of their more interesting customs used to be the collection of testicles removed from the bodies of fallen enemies. I'm not sure if this is a current practice. I don't know about them, but WE have this practice that was inaugurated in the late 80's. Just about the same time we all inaugurated the practice of extreme narcissism, eh papa? I'd rather say A Way Of Life. I agree, Barney. It seems as though, out of mere spite for the term, people are confusing common decency, empathy, and respect for "political correctness". Those things existed long before the idea of being "PC" came about, and people need to stop using their hatred of an idea they don't understand as an excuse to disregard the others. Fantastic place and some really nice shots! The lake of fire looks awesome. And that's WHERE you'll go if you don't REPENT..!!!! I'd love to go there for the culture and the views, but Eritrea and Somalia frighten me a bit.. I have a camel disguise for sale. Most of these awe-inspiring places scare me a bit. That's how I ended up with 1000+ RAWs of my lawn furniture. I lived in Eritrea (pre independence) for three years, but never made it down to the Afar region. Some friends travelled there and had an incident. They came upon an Ostrich in the road. They pulled up to it to make it move. It didn't. The driver blew the horn and that startled the Ostrich. It kicked the radiator, causing a leak. They were lucky they had another car that towed the disabled vehicle to civilization. What a great story. Those birds have a reputation for being really nasty. That was like a Looney Tunes tale. Thanks for sharing. Sorry it made me laugh. Glad you all got out safe. Very interesting. Is selassies countryside palace still standing? A very interesting article, and very well done images. Beauty is in the eye of the beholder -- visually, only a couple of the images really catch my interest. 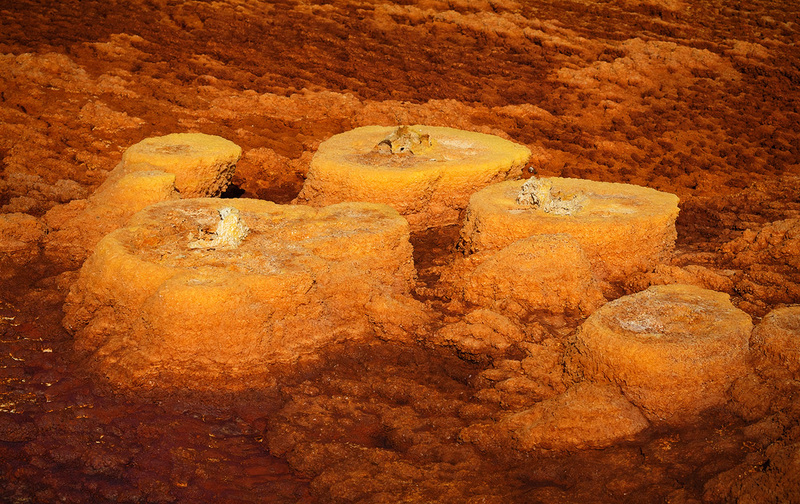 The sulfuric acid 'lake' and the caravan shots are outstanding. It's amazing to me that anyone would live in this area. I have to pity the poor camels marching across that terrain carrying salt bricks. "Hyperbole" ends with an 'E' not a 'Y'. Stunning views though: Be a long time before this place is overcome by tourism. The camel caravan is one of the most evocative shots I've ever seen. Ditto on the caravan shot. Very David Lean-Lawrence of Arabia-esq. Thanks Westkip, I'm glad to know you liked the images.